June | 2011 | Htbaa blogs? For about a year now I’ve been using 2 monitors on my main PC at home. A 19″ and a 17″ display. 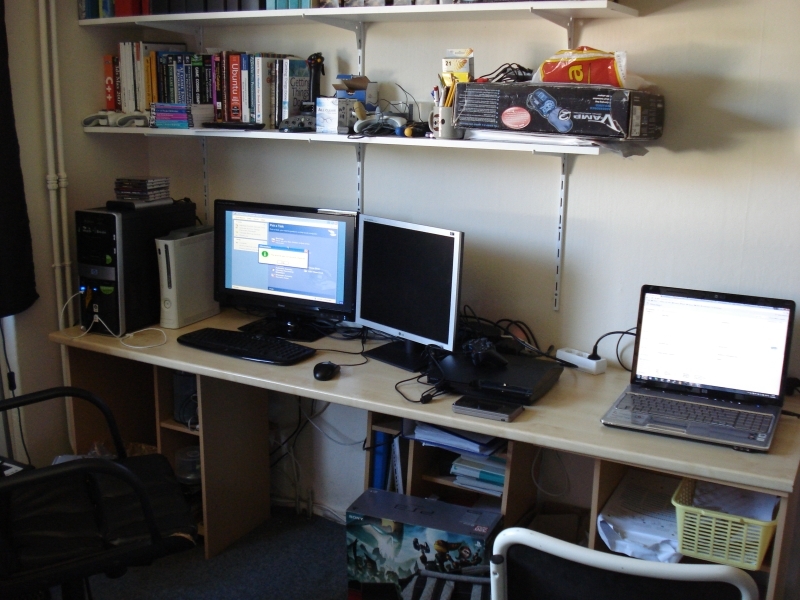 At the same time at work my setup got changed from a single 19″ (worked with a single 17″ even before that!) to a nice 24″ widescreen with a 19″ monitor next to it, which mostly displays my e-mail client and some terminals displaying status reports. Since I’ve gotten so used to this setup and getting annoyed with my setup at home I decided to do something about it. Now don’t get me wrong, dual-screen is a luxury but due to limited desk size and the way my 17″ is constructed I had to put it in a 45 degree angle from my main screen. This simply didn’t work out. On top of that having only 1280×1024 pixels available per screen doesn’t allow for much open windows. Full screen editing with Vim having multiple vertical- or horizontal-splits together with a NERDTree open wasn’t much fun either. I had thought about getting a 27″ screen but already found a 24″ rather large, so I went with that. I chose a iiyama ProLite 2473HDS. It has a DVI, VGA and 2 HDMI inputs, as well as a audio-in/out. The speaker quality is rather nice actually. It’s a Full-HD screen that supports 1080p, which is its native resolution. With the HDMI and Full-HD support I also have my PlayStation 3 connected to it, as well as my Xbox 360 (over VGA). No more fiddling with changing cables when I want to play Xbox 360. The PlayStation 3 experience is also so much better on a nice HD display. Before this I had it connected to a normal TV screen. Another pro is that I now actually have more room on my desk! I can finally keep a book next to me with my new setup. Anyway, here’s a picture.